Along with the “fine art” images I shared in my previous post, the Highland trip offered a complete change of pace to environmental photojournalism. I’ve always admired the work of Robert Glenn Ketchum in this realm, and of course, his book on the Hudson Valley is especially dear to my heart. Ketchum shows how you can make beautiful images while, at the same time, documenting environmental degradation. Now, I’m far from claiming that my work is anything like comparable to Ketchum’s, but I do feel a responsibility to use my skills to document and raise awareness of the harmful effects of both manmade and natural disasters on the environment. It began with a shot I took a few years ago of the controversial Indian Point Nuclear Plant in Buchanan, NY–the plant ironically framed by trees from my vantage point across the Hudson at Stony Point–and more recently, I was encouraged to pursue this work during a portfolio review with well-known photographer William Geddes. The aftermath of Hurricane Irene left no end of opportunities to document the destruction in the Hudson Valley, and back in the summer I photographed various places, including this very spot from above, looking down from the Walkway over the Hudson, and posted images in my Hudson Valley blog. One of those evocative images, a wide-angle view of the swollen, brown, green-flecked river, was awarded Pick of the Week in the Environmental Photojournalism category on the website of Nature Photographers Network, of which I’m a member. Now I found myself down on that very shore, eye level with the persisting effects of the storm. The first picture (above left) shows how part of this wooden walkway, part of an outdoor area belonging to a local restaurant, has buckled. I took a horizontal as well but chose this vertical to process because it’s a tighter shot, focusing in on the buckled portion of the walkway. 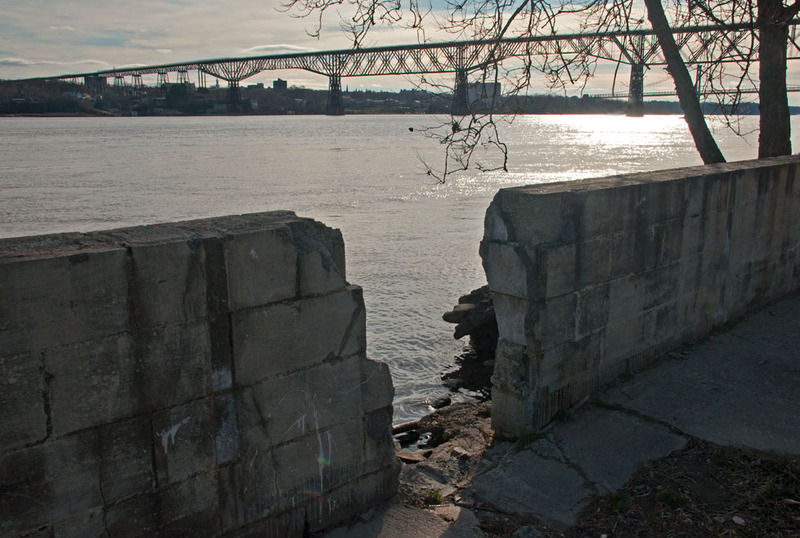 The next image (above) shows how the flooded Hudson River breached the brick wall at the new Highland Landing Park, leaving a gap. 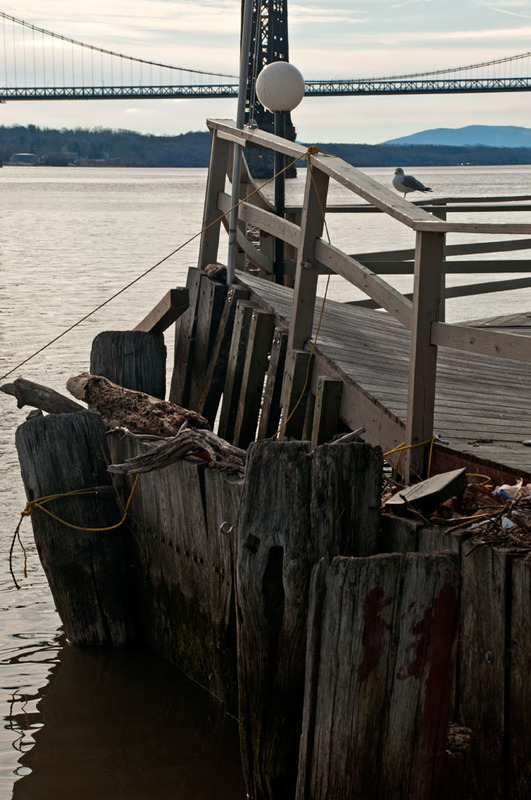 Notice how both of these images, while highlighting the destruction I want to show, still includes enough of the surroundings to show where we are; this is the Hudson River, the Hudson Valley. In the final image (above left) I had to turn my back on the river and the two bridges. 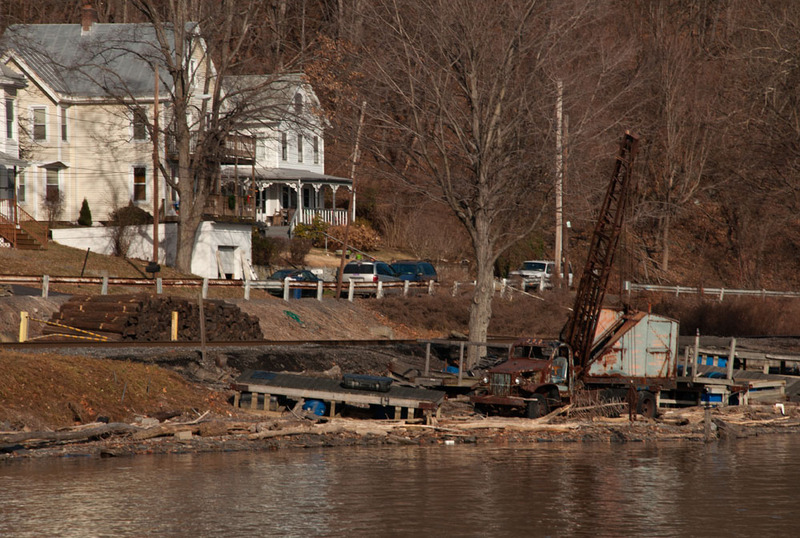 Here you see homes on the shore, homes that should enjoy a lovely view of the river, but since the summer they’ve had a front-row seat to watch construction equipment repairing the extensive damage caused when the river overflowed the banks. The work proceeds slowly, no doubt because it’s not merely a matter of repair but also one of preventing, as far as possible, that this level of damage could occur again. In my next post I’ll show you a couple of miscellaneous opportuinities that presented themselves on this shoot. Did I succeed in taking the best advantage of them? I’ll let you decide.